Papel picado is a traditional Mexican folk art of colorful tissue paper cut with intricate designs. Artists string the individual papers to form banners that are used for a number of holidays and festivals. 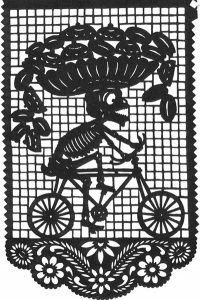 For the Day of the Dead, banners with skeleton themes, like this one, are hung around the offering and often in public squares as well. Artists cut the paper by hand with tiny, very sharp chisels. They follow a pattern and place a lead plate at the bottom of a stack of paper, so they can cut through as many as 50 sheets at once. Cut plastic instead of paper is a new innovation that allows the decorations to survive outdoors in the wind and rain. This piece of papel picado is currently on exhibit in Life After Death: The Day of the Dead in Mexico with a number of others in paper and plastic.